Through the openness of PC-based control technology, major technological benefits can be leveraged in conjunction with numerous communication networks. The new EP9300 EtherCAT Box, for example, provides a gateway to PROFINET RT networks. This enables the use of the high-performance EtherCAT Box I/O system as an integrated IP 67 solution in PROFINET environments. 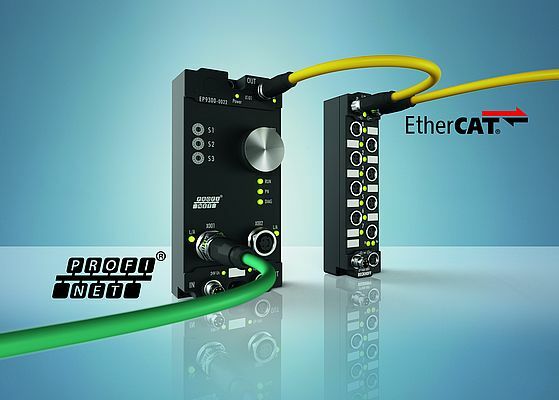 The IP 67-protected EP9300-0022 EtherCAT Box from Beckhoff connects PROFINET RT networks with EtherCAT I/O modules, enabling local installation in the field. This extends the higher-level network - entirely without the use of a control cabinet - with a subordinate, high-performance, and ultra-fast I/O solution. The telegrams are transferred from PROFINET RT to EtherCAT and vice versa, so that the EtherCAT Box modules can be integrated seamlessly. The shock- and vibration-resistant, sealed EP9300 EtherCAT Box is connected to PROFINET via a d-coded M12 socket. The I/O system consists of an EP9300, to which a wide range of standard digital and analog EtherCAT Box modules can be connected, as determined by the respective process data volume. The three EtherCAT Box series - EP, EQ and ER - provide a wide range of IP 67 I/Os, which can be installed directly in the field. The range includes standard digital I/Os and modules with special integrated functions, such as stepper motor modules or modules for highly complex measuring tasks. The EtherCAT Box I/Os are available with different housing types to meet the requirements of a wide range of industrial applications. The EP series with plastic housing is ideally suited for moist, dirty, or dusty conditions in general machine construction, in assembly applications, or in semiconductor and logistics environments, for example. The EQ module series, with its stainless steel housing and IP 69K protection, is designed for applications in the food/beverage, chemical, and pharmaceutical industries. The modules from the ER series have a particularly robust, fully sealed die-cast zinc housing, making them ideal for harsh industrial and process environments, such as pressing systems and metal foundries, or automotive environments and robotics applications where weld spatter resistance is a key requirement.